Oslo Come Take A Break explore Oslo the capital of and most populous city in Norway. The city is also a hub of Norweigian trade, banking, industry and shopping. It is an important centre for maritime industries and maritime trade in Europe. The city has a large and varied number of cultural attractions, which include several buildings containing artwork from Edvard Munch and various other international artists but also several Norwegian artists. Several world-famous writers have either lived or been born in Oslo. Examples are Knut Hamsun and Henrik Ibsen. Oslo houses several major museums and galleries. The Munch Museum contains the Scream and other works by Edvard Munch, who donated all his work to the city after his death. The National Museum holds and preserves, exhibits and promotes public knowledge about Norway’s most extensive collection of art. The Museum shows permanent exhibitions of works from its own collections but also temporary exhibitions that incorporate work loaned from elsewhere. On the other hand, a large number of festivals are held in Oslo, such as Oslo Jazz festival, a six-day Jazz festival which has been held annually in August for the past 25 years. Oslo’s biggest Rock festival is Oyafestivalen. It draws about 60,000 people to the Medieval Park east in Oslo and lasts for four days. In addition, Oslo houses over 20 theatres, such as the Norwegian Theatre and the National Theatre. It is the largest theatre in Norway and is situated between the royal palace and the parliament building. Hotel Accommodation near Theatres are below. National Theatre Where to find the local Accommodation The main attractions of Norway are the varied landscapes that extend across the Arctic Circle. It is famous for its fjord-indented coastline and its mountains, ski resorts, lakes and woods. 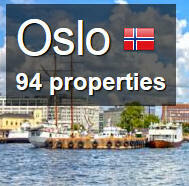 The main tourist cities in Norway are Bergen, Stavanger, Trondheim, Tromso and, obviously, Oslo. Much of the nature of Norway remains unspoiled, and thus attracts numerous hikers and skiers. The fjords, mountains and waterfalls in Western and North Norway attract several hundred thousand foreign tourists each year. The one traditional Norse dish with a claim to international popularity is smoked salmon. It is now a major export, and could be considered the most important Scandinavian contribution to modern international cuisine. Smoked salmon exists traditionally in many varieties, and is often served with scrambled eggs, dill, sandwiches or mustard sauce. Another traditional salmon product is gravlaks, (literally “pit salmon” or “buried salmon”). Traditionally, gravlaks would be salted, buried in the ground and left to ferment. A large number of fish dishes are popular today, based on such species as salmon, cod, herring, sardine, and mackerel. Seafood is used fresh, smoked, salted or pickled. Variations on creamed seafood soups are common along the coastline. High cuisine is very reliant on game, such as elk, reindeer (strictly speaking not game, as nearly all Norwegian reindeer are semi-domesticated), mountain hare, duck, rock ptamigan and fowl. These meats are often hunted and sold or passed around as gifts, but are also available at shops nationwide, and tend to be served at social occasions. On the other hand, Norway has a particularly strong affinity for coffee in Norway is plain black, usually in a mug, rather than a cup. As in the rest of the west, recent years have seen a shift from coffee made by boiling ground beans to Italian-style coffee bars, tended by professional baristas. Another popular drink is beer. The most popular industrial beers are usually pilsners and red beers (bayer), while traditional beer is much richer, with a high alcohol and malt content. Take A Break Holidays takeabreakholiday, Oslo Accommodation.